Corofin and Milltown have been drawn to face each other in one of the upcoming county football semi-finals, while in the other semi-final, Barna will face St Michael’s in a novel pairing after both sides had impressive victories over Caherlistrane and Annaghdown respectively last weekend. Corofin, who are most people's hot favourites to reclaim the Frank Fox Cup again this season, moved a step closer to doing just that when they defeated Val Daly's Mountbellew/Moylough at Tuam Stadium last Sunday afternoon in an early throw-in. Having already beaten Mountbellew in the championship in the first round, Corofin found it difficult to get a run on the black and amber men and it took a well-worked Michael Farragher goal just before half time to put some real daylight between the sides. Former Galway star Joe Bergin alternated between midfield and full-forward for Mountbellew and he did well to rattle the Corofin net in the third quarter to give some hope to Mountbellew. Despite a black card for Galway dual star Daithí Burke, Corofin rattled over a few quick scores and ran out six point winners on a 1-13 to 1-7 scoreline. They had good displays from Gary Sice, Kieran Fitzgerald, Justin Burke, Martin Farragher, Kieran McGrath and Cathal Silke at corner back. It was good to see Mountbellew's Gary Sweeney back to full fitness and hopefully he will have an injury free season with club and county in 2015. Unfortunately Galway defender Joss Moore was again unavailable for his club and the word on the terraces was that the Mountbellew man is facing an extended absence due to his ongoing knee injury. We wish him well in his recovery from that injury. Corofin's opponents in the upcoming county semi-final, Milltown, had a commendable one point win over Salthill-Knocknacarra on a 1-13 to 0-15 score-line, also at Tuam Stadium. The crucial goal for Milltown was scored by Fergal Nicholson on the stroke of half time and they had other scoring forwards in Michael Martin (0-4, 3fs ), Mark Hehir (0-2, 1f ), and wing-forward Damien Brennan, who shot three points from play. Others to catch the eye for John Concannon's charges were team captain Darren Mullahy, centre-back Seán Blake, and John Martin. 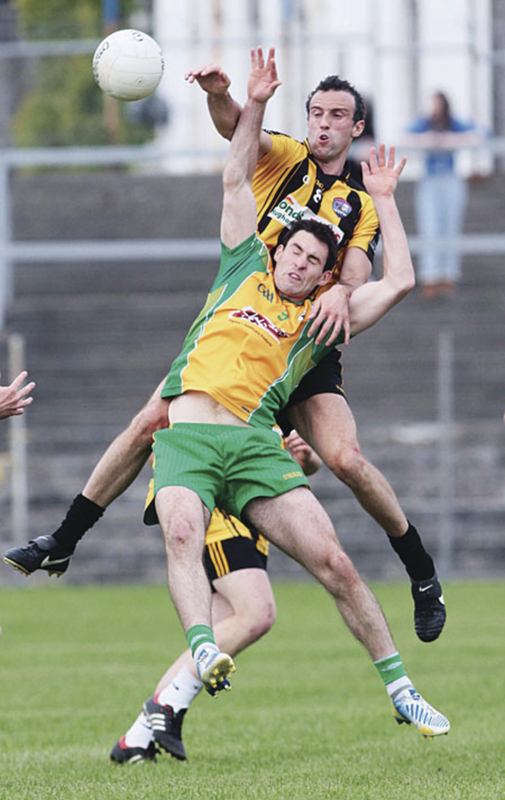 Elsewhere Barna had a very impressive 2-15 to 1-13 win over Caherlistrane at Corofin last Saturday afternoon. Pat Fallon's team started poorly and conceded an early goal courtesy of an Oisín O' Brien penalty. However the Connemara men bounced back impressively and with Jason Lyons impressing at wing-forward and shooting 10 points (6fs ), and strong performances from Donal Feeney, Eoin McDonagh, Tom Curran and Rory O' Donnellan, they fully deserved their victory. At stages they flooded their defence and when they put a lot of bodies behind the ball, they were difficult to break down. Their opponents in the county semi-final will be St Michael’s who had a slender 0-12 to 0-11 win over Annaghdown. County player Eddie Hoare was to the fore as usual and he notched eight points (0-5fs ) and was a key player for his side. He had powerful support in the middle of the defence from Alan Glynn and Jamie Downes. Others who impressed were Eamonn O' Donnell, Brian Madden and centre-forward Greg Rogan.